A panel opening discussions on culture, race, and gender. 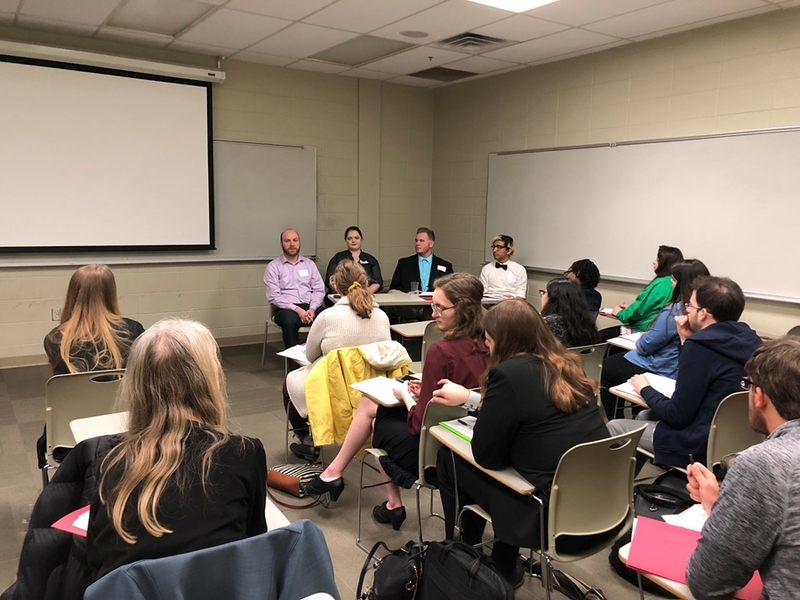 No amount of rain could hold back the Graduate Students in English conference, an interdisciplinary conference held in Kimpel Hall on March 9, that revolved around the topic, "Opening Doors: Creating Opportunities for Difficult Conversations." Undergraduate, graduate, and faculty presenters came together from eight universities, representing a range of departments, in order to open conversations on topics in grief and death, mental and physical health, literature, gender and sexuality, culture, race, birth, pedagogy, and economics. Source texts for presentations ranged from Edgar Allan Poe's "The Raven" to Dungeon and Dragon's The Adventure Zone, and from the video game Night in the Woods to HBO's True Blood. From 8:00am to 5:00pm participants presented on, listened to, and questioned the world around them, sharing their thoughts and ideas openly in the hopes of shining light on difficult topics. The opportunity to discuss academic projects with people outside our regular environs is always an invaluable experience, and this conference provided desperately needed moments to expand knowledge and make new connections with ideas and with people both in our own university and beyond. The chance for interdisciplinary conversations led to cards and numbers being swapped between writers from a variety of departments and universities who might not otherwise have crossed paths. Alongside the 13 panels, the well-fed participants (funding from the Associated Student Government ensured everyone ate well throughout the day) had the chance to attend a brown-bag discussion, led by Lisa Hinrichsen and Leigh Sparks, graduate advisers from the University of Arkansas Department of English, on how to create strong applications to graduate programs, a topic many students find stressful and overwhelming. Lunch was followed by a keynote presentation given by professor Padma Viswanathan from the Creative Writing Program at the University of Arkansas. Her talk, "Writing the Unspoken, Righting the Spoken: Fictional responses to unfortunate utterances," focused on how her novels, and fiction in general, have served to open conversations on topics both close to home and globally. The whole day was a resounding success, and the Graduate Students in English officers want to offer their thanks to the presenters, moderators, attendees, facilitators, and to the Associated Student Government for helping to make this day go so well.